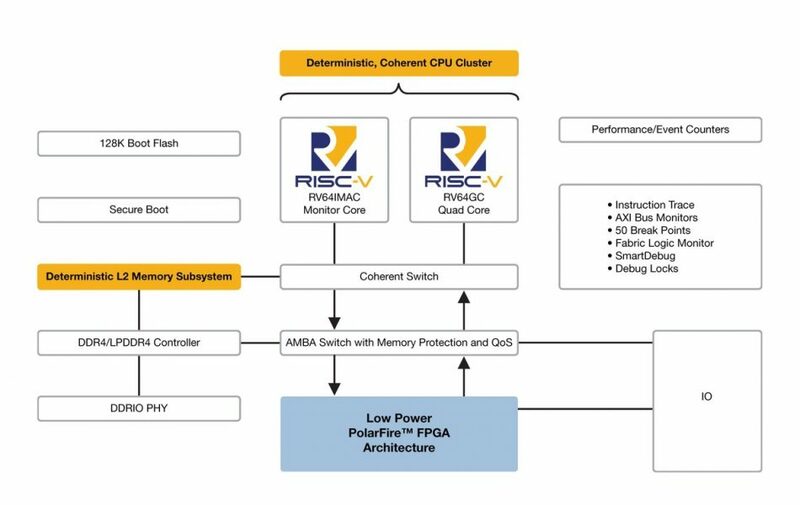 Microchip’s Microsemi subsidiary has taken a similar course for its adoption of the RISC-V architecture as it did when it embraced the Arm architecture more than a decade ago. 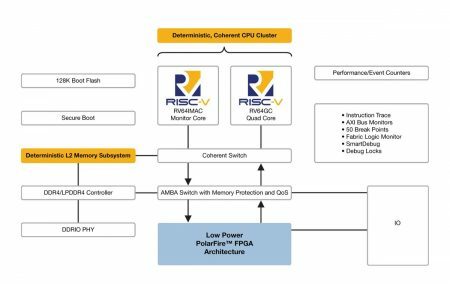 Having already introduced soft-IP versions of the RISC-V processor, the company has moved onto embedding hard-IP cores with the launch of its latest PolarFire FPGA SoC. Launched at the RISC-V Summit in Santa Clara, CA, Microchip’s PolarFire SoC architecture is designed to run Linux-class operating systems with an asymmetric multiprocessing (AMP) design that couples a 64bit quad-core cluster and a separate 64bit processor for monitoring. The processor complex was developed in conjunction with SiFive and providers 2MB level-two memory subsystem that can be configured as a cache with support for coherency, scratchpad, or a direct-access memory to let designers tune the level of determinism needed in data accesses for real-time embedded systems. PolarFire SoC includes a number of debug capabilities including instruction trace, 50 breakpoints, passive run-time configurable Advanced eXtensible Interface (AXI) bus monitors and FPGA fabric monitors, in addition to Microchip’s built-in two-channel logic analyzer, SmartDebug. The PolarFire SoC architecture includes reliability and security features such as Single Error Correction and Double Error Detection (SEC-DED) on all memories, physical memory protection, a cryptoprocessor with protections against differential power analysis, secure boot and 128KB of Flash boot memory. Evaluation and design with PolarFire SoC are supported by the antmicro Renode system modelling platform, which is now integrated with Microchip’s SoftConsole Integrated Design Environment (IDE) for embedded designs targeting PolarFire SoCs. A PolarFire SoC development kit is also available, which includes of the PolarFire FPGA-enabled HiFive Unleashed Expansion Board and SiFive’s HiFive Unleashed Development Board with its RISC-V microprocessor subsystem. As part of today’s announcement, Microchip is launching a new Mi-V Embedded Experts Program, a worldwide partner network to help customers with hardware and software designs for PolarFire SoC. Members get access to direct technical support and early access to development platforms and silicon.